If your bin is often overflowing with plastic bags and food wrappers, how about using them to build a wall or make furniture instead? Made entirely from plastic, ecobricks are bottles filled with tightly packed non-recyclable bags. 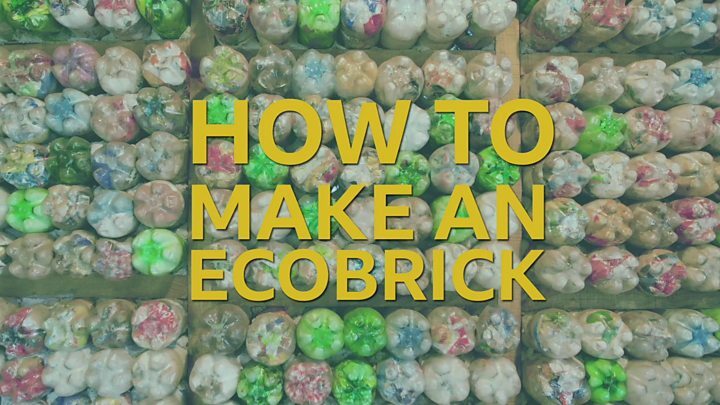 Now a group of "ecobrickers" in Swansea is planning to use them to create the first major art installation of its kind in the UK. 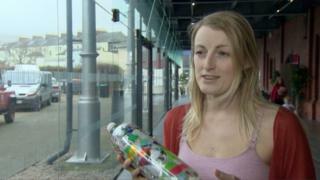 Phoebe Dawson set up Ecobricks Swansea after seeing a photograph online. Media captionPlastic pollution: How do you build an ecobrick? "You stuff it all in a bottle so it's really dense and then you can use it to build all sorts of things," she said. "You can bond bottles together to make modules and then build them together to make stools for inside or build them with cob [water-resistant mud and straw mix] to make furniture for outside. "The key thing about ecobricking is raising awareness of how much plastic we consume in our society. "When you put it in the bin it's easy to forget about it but when you are actually washing it and drying it and cutting it up it really opens your eyes to how big the problem is." The Swansea group has now joined forces with the city's National Waterfront Museum to hold public workshops and to create an art installation - a large "wave" curving off a wall in its courtyard. The wider community and schools are being encouraged to take part in the project, which is due to be unveiled in the summer, and all the bottles used in the sculpture will be donated to a local community group at a later date. Leisa Williams, senior learning officer at the museum, said: "The group has been holding workshops for people to learn more about ecobricks and to get involved, even if it's just dropping off plastic and bottles." The group is part of a global movement - an ecobricks UK Facebook group, which was set up last March, has about 40,000 members. Artist and ecobricks trainer Lizzie Wynn, from Llandecwyn in Gwynedd, has been using filled plastic bottles in her work for the past few years, and last year constructed a small ecobrick building. From next month she will start teaching courses in ecobricking at the Centre for Alternative Technology in Machynlleth. "This is the start. The intention is to do further research but also to get people used to seeing them as a building material," she said. "People are building very successfully in other countries with them [and] are getting very excited about ecobricks. "They are not easy to make and it takes dedication but people are really grasping the concept."